Zeox iPad Air 2 Slim Smart case cover is designed to provide maximum protection for iPad Air 2 and add to the uniqueness of your iPad Air 2. The front cover of the Zeox Slim Smart Case Cover for iPad Air 2 provides the smart wake up and sleep feature by smart flat magnets built into it. The Zeox iPad Air 2 PU leather Slim Smart Case Cover provides complete protection for Apple iPad Air 2 without adding unnecessary bulk. Snap on hard polycarbonate rubberized back case with the magnetic front smart case cover allow to enjoy your Apple iPad Air 2 without worrying about scratches and dents. Auto wake up/sleep feature to extend iPad Air 2 battery life and save on power and its microfiber interior layer secures the retina display from dust and scratches. 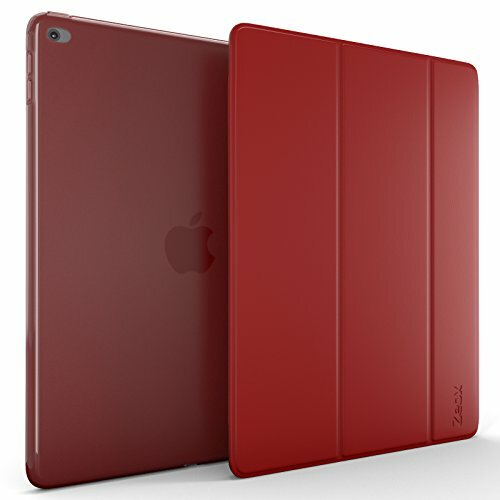 Zeox iPad Air 2 Slim Smart Case Cover is compatible with all Apple iPad Air 2 models. Zeox is a registered trademark of Zeus Group INC or its subsidiaries protected by the US Trademark Law. Zeox products are sold by Zeox only. Zeox iPad Air 2 Slim Smart Case Cover designed specifically for Apple iPad Air 2 Tablet released in 2015. Easy access to all features, jacks, ports and buttons without removing the case. Full body ultra protection for the iPad Air 2 2014 Release. Safeguards iPad Air 2 against drops and shocks by transparent hard polycarbonate back case and front premium PU leather front smart case cover. Auto wake up/sleep feature to save on power and battery life. Close to sleep and open to wake up to maximize your Apple iPad Air 2 battery life and save on power while protecting it. Stand feature allows vertical and horizontal convenient positions for watching movies and typing. Ultra strong built-in magnets holds the folded front cover panels firmly to stand the iPad Air 2 and let you enjoy iPad Air 2 without holding it. Easy installation, simply snap-on, and protect the Apple iPad Air 2 with the premium crafted Zeox iPad Air 2 Smart Case Cover. Zeox products are exclusively sold by Zeox only with lifetime warranty on any manufacturer defects. If you have any questions about this product by ZEOX, contact us by completing and submitting the form below. If you are looking for a specif part number, please include it with your message.